Hello readers! 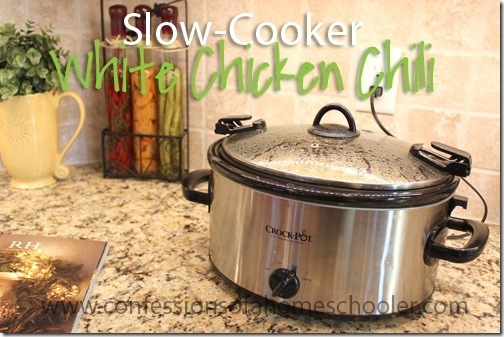 Oh my goodness, you have to try this amazing slow-cooker white chicken chili recipe! Okay, that sounded kind of bossy. But seriously, it’s so delicious and since it’s a slow-cooker recipe, you just toss everything together in the morning and let it cook until you’re ready for dinner! And this homeschooling mama loves anything that can help reduce dinner time chaos! I did want to mention that I’m not that creative, so this recipe was modified from the original Taste of Home recipe to fit the likes of our family. I was introduced to it by my sister-in-law who made it at a family gathering, and we all loved it! Which is rare for a family of 6. There’s usually at least one person who doesn’t like my cooking on any given day. Anyway, ready to get started? Optional: tortillas, cheese, black olives, and sour cream for garnish. 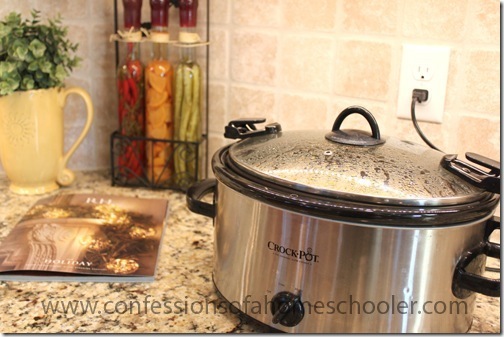 See that lovely Restoration Hardware holiday magazine in the photo? Yeah, I read that while I cooked my tortillas. It was extremely stressful. Since I was in a hurry, I used a can of white chunk chicken, then I shredded it a bit with a fork. You can also use about 2 cups cubed cooked chicken breast, I like to make a bunch then freeze it so I can add it to soups in a jiffy. Did I just say “jiffy”? About 20 minutes before you’re ready to eat heat up some tortillas, and then get out a little bit of cheese and sour cream for added garnish. 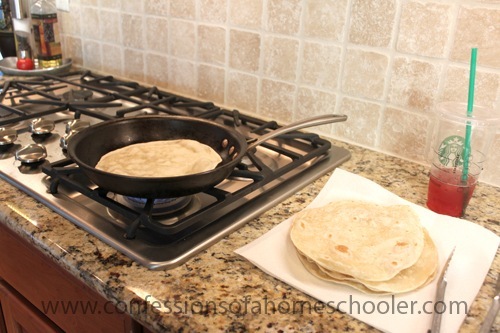 We love to use the fresh frozen tortillas from Costco. They come raw, so you just have to heat them up on a dry skillet over medium heat. I cook them for about 20-30 seconds on each side. You can tell they’re done when they bubble up and turn a more white opaque color. If you like Starbucks Blackberry Mojito Tea Lemonades, you might just want to get one for the tortilla cooking. It really seems to help the process go a bit more smoothly. I also found some raw corn tortillas at my local grocery store this week too. Man those were AWESOME! I find they are great for when I’m in a hurry. After discovering the raw tortillas, I don’t think we’ve eaten the pre-packaged tortillas in, well forever. No one likes them anymore. And if you have the time, you’re welcome to go all crazy and make them from scratch using this homemade tortilla recipe! And that’s it! This delicious recipe is awesome for busy nights, not to mention perfect for the cooler snowy months! Delicious, creamy, chili recipe great to warm your soul on a cold day! 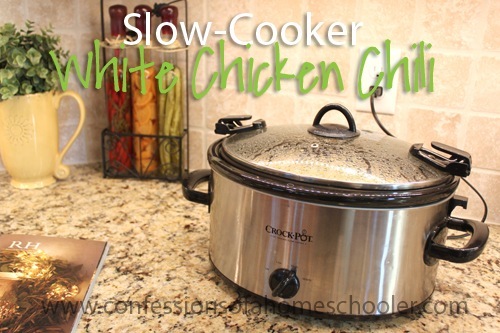 Add all ingredients in a crock pot and cook on low heat for 3-4 hours or until heated through. Serve with sour cream, shredded cheese, and sliced black olives. Sorry for the typo! I forgot the beans! Yes, 2 15 oz. cans White Northern Beans rinsed and drained. I was wondering about the beans. You mention them but they are not on the ingredient list. Made this for a chili cook off and it was loved by many! Sending them all to your site! I was wondering about the MIA beans. Judging from the picture I would say white navy beans, maybe 1 can or 2. Any ideas? I was wondering about the beans too. I see them in the photo. Looks yummy! 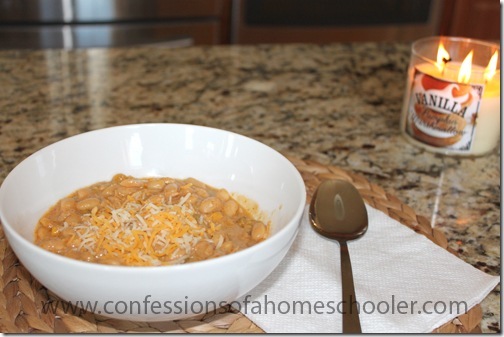 I am always looking for a dish that will satisfy the whole family. Definitely trying this one! Following for the bean answer! Lol 🙂 looks delicious! Thanks for the recipe! I made it last night for a Chili Cook Off at church. I won the People’s Choice Award! So good! No leftovers! Made this tonight, and it was delicious! Thanks for the recipe!! I made this recipe, it’s really yummy! Bur the first time I thought the cream cheese was only to garnish it… so my second try I added only 1 cup of chicken broth and added the rest of the ingredients as specified… girl… it was wonderful!!! Will definitely make it many more times!! Thanks for sharing the recipe!! !